Game production has changed in myriad ways over the last 15 years, but few aspects of development have been elevated more than the craft of writing. 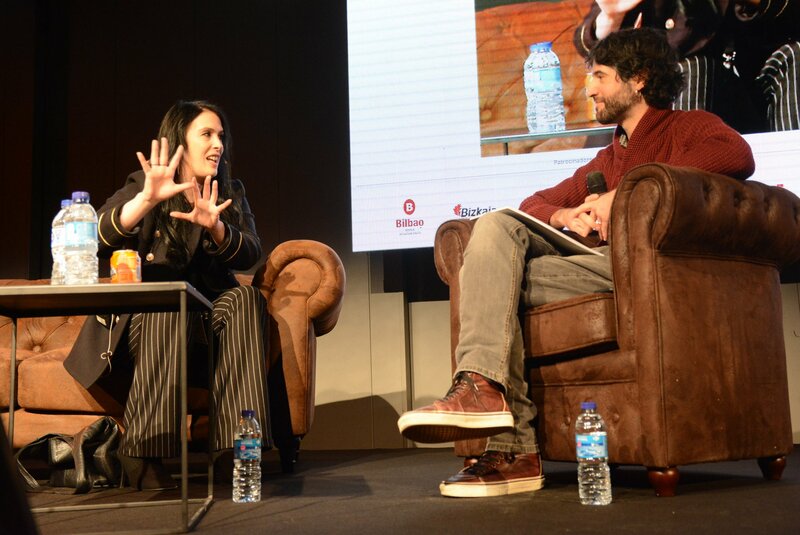 That idea shone through in the juxtaposition of two talks at the Fun & Serious Festival in Bilbao, Spain; the first given by one of the industry's most experienced and public-facing writers, and the second by a relatively new talent fresh off her biggest project to date. The first speaker was Rhianna Pratchett, who scarcely needs an introduction. If pushed, though, one might argue that her finest achievement was the reinvention of Lara Croft for Crystal Dynamics' rebooted Tomb Raider series. In that case, Pratchett was given a brief and, more importantly, the time and freedom necessary to rejuvenate one of gaming's true icons. It wasn't always the case. Pratchett recalled her first job writing on a game with Larian Studios, which she picked up after leaving a full-time position on PC Zone magazine. It was 2002, and writing was rarely even acknowledged as part of how games were made. "I had to cut through the narrative jungle on my own, and fail and succeed on my own"
"I didn't know anything about games writing at the time," Pratchett said. "In all the time I'd been a journalist, there was no need; nobody had sat me down and said 'here's the writer', or even 'here's the designer, who also does some writing'. Nobody talked about it at all. It was really uncharted territory. "The industry was so young in terms of employing writers -- not narrative as a whole, but employing writers -- that [when I asked for work] people went 'er, okay then, we could probably use a bit of help'. "It was very random and made up as a I went along, and I had no mentors because most of the time I was the only writer on a team. I was very rarely in the situation where there was somebody on the team who knew more than I did. I had to cut through the narrative jungle on my own, and fail and succeed on my own." Even as Pratchett found her feet and started to understand the specifics of writing for games -- as opposed to, say, writing a novel or writing for television -- the industry itself was slow to catch up. She coined a term that encapsulates what the majority of her jobs at that time asked her to do: "narrative paramedic", a kind of emergency worker brought in to surgically attach stories to games in need of meaning. The one example that stands out from all of the others is Mirror's Edge, she said, the stylish parkour game that EA DICE released in 2010, and is now considered an under-the-radar classic of the Xbox 360 / PlayStation 3 era. "Everything had been designed with no narrative in mind when I was brought in," she told the crowd at Fun & Serious. "The levels had all been designed, the look of the world had been designed, the way the character moved through the world and the way the character looked had been designed. "But nobody had thought about why. Nobody had thought about why she [Faith Connors, the game's distinctive protagonist] moved like that, why the city looked like that -- y'know, what is the reason why any of this is happening? "Basically, a lot of it was done because it was cool, or it felt right, but nobody had thought about why. I had to go in and wrap a narrative around what was there, which would be a completely backward way of working in other entertainment mediums. "Writing was the only part of game development that, for a long time, was not done by professionals skilled in that field"
"That was probably my biggest narrative paramedic job, and I think we did the best we could with the time and budget we had available. But, obviously, if I had been involved earlier in the process all of that could have been designed at the same time." Pratchett assured the audience that there are worse stories, which tumble from the mouths of games writers any time enough alcohol has passed their lips. One writer, she said, was asked to produce 100,000 words in a single week for a game nearing completion. Another was "brought in to rewrite every cut-scene, but each line had to be the exact length of the line it was replacing. "All sorts of crazy stuff that I've never heard about in any other industry, and it's just because writing was often the last thing thought of and the first thing pulled apart by the rigours of game development. "Writing and narrative were not given the same love and attention as other aspects of game development. It was seen as a second class citizen; as something that anyone could do, that you didn't need to be particularly skilled. If you could write words and you'd read a book or seen a TV show, it meant that you could write the story. "It was the only part of game development that, for a long time, was not done by professionals skilled in that field." Mirror's Edge was scarcely ten years ago, but Pratchett said that writing and narrative now plays a major part in the creation of a wide range of games. Not only are there far more professional writers specialising in games, the industry is generating its own talent in the field. It is not only recognised as a skill now, but there are now multiple prestigious awards dedicated to recognising the best examples of the craft. "It makes me feel like an aged veteran," Pratchett added. "A little bit like Roy Batty at the end of Blade Runner. 'I've seen narrative designs on fire on the shoulder of Lara Croft' -- that kind of thing." Ubisoft's Melissa MacCoubrey, the second speaker, is far from an aged veteran. Indeed, she is an example of the industry nurturing its own writing talent, having joined Ubisoft Montreal as a scriptwriting intern in 2013. 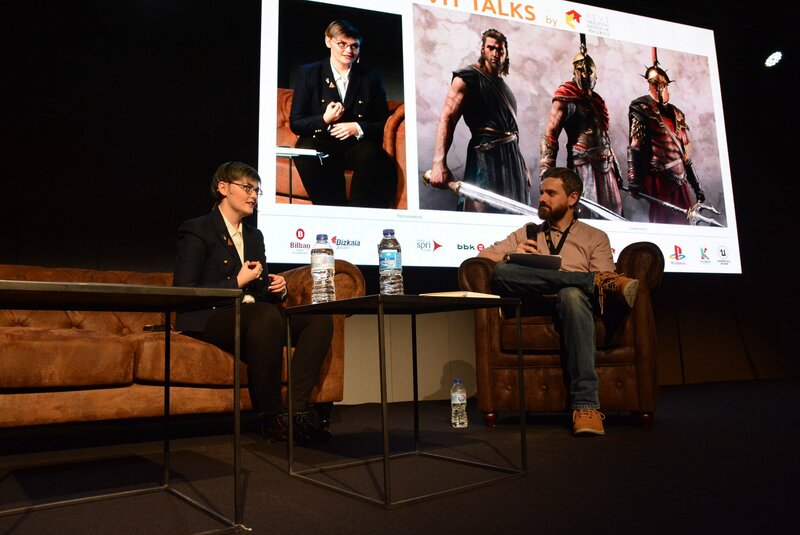 Since then, she has worked on various games in the Assassin's Creed series -- including Black Flag and Syndicate -- and was the director of narrative design for last year's Assassin's Creed Odyssey. It is an impressive title after just five years in the games industry, but it should be noted that, five years into Pratchett's writing career, job titles like that barely existed. Where Pratchett talked about being the only writer on a given project in her early years, MacCoubrey emphasised how collaborative the writing process is now -- not only with the various disciplines involved in making games, but with the other people working on writing and narrative within the company. In fact, Ubisoft hosts an internal "narrative conference" each year, which MacCoubrey joked was akin to a UFC-style showdown between writers. "When you're developing systems to put into a game, you're thinking at the same time about how it's going to service the story"
"It's where we give presentations to narrative people on other teams, to show how we did things, why we did things, how we move forward," she said, unwittingly echoing Pratchett's description of what EA DICE didn't do on Mirror's Edge. "It's always very helpful." For the most part, the days of the "narrative paramedic" are over. When asked by a member of the audience when writers are brought on to a project at Ubisoft, MacCoubrey suggested that they are in place virtually from day one. "The story comes in very early [in the development process]," she said. "When we started looking at setting a game in ancient Greece, one of the things that struck me very early was, well, we have The Odyssey. And because we're pushing for open-world exploration, this should be a huge influence. Then we looked at all the other methods of storytelling; we saw Greek Tragedy as a very prominent part of our storytelling. "When you're developing systems to put into a game, you're thinking at the same time about how it's going to service the story, and how the story is going to lift those systems up." It is the kind of joined-up thinking between writing and design that Pratchett said was entirely absent for so many years. In Odyssey, MacCoubrey said, even NPCs that the player never speaks to were created in conjunction with the animation team, to be sure that both their movements and their words evoked the various groups that comprised the society and culture of ancient Greece. "With all of those characters, we really try to give them lines that help build the world around you," she said. "They're always talking about culturally relevant things." In AAA games, writing and narrative are now key areas of investment in a way that would have been difficult to imagine 15 years ago. The narrative team on Assassin's Creed Odyssey comprised 23 people, with a dedicated writing team in all three main studios that worked on the project. "Which is big," she said, laughing. "But we knew it would have to be big, because we were making a beast. We were making an Odyssey."